It’s summertime and the reading’s pleasing! 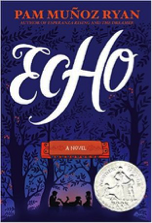 I started off the summer with a wonderful historical fairytale: Echo by Pam Munoz Ryan. I sought this book out originally because it was a 2016 Newbery Honor and was not disappointed. It is beautiful and powerful storytelling. It has the magic and mystery of the woods, the depth of a past vividly retold, and music that strengthens 4 different lives. I spent a lot of time with comics as well. I especially looked forward to each new monthly installment of Paper Girls by writer Brian K. Vaughan and artist Cliff Chiang. It’s a teen scifi/horror story set in the 1980s. Filled with girl power, as four 12-year old paper girls take on time travel and aliens in their suburban hometown. To top off a great story, its filled with lots of fun nostalgia just as another summer favorite: Netflix’s Stranger Things. Overall this was the summer of Yancey, Rick Yancey. 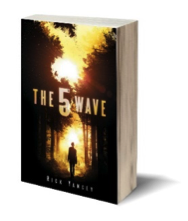 I finally picked up The 5th Wave and was not disappointed. I had tried my best to write my own interpretation of finding hope when one can’t trust and Yancey showed me how it’s done. But this wasn’t even my favorite of his. I was looking for a good monster book this summer and by finding The 5th Wave, I was led to his earlier work: The Monstrumologist. It was filled with a creepy monster, unknown to me, and was delightfully filled with appropriate amounts of guts and gore. Not to mention, the monster hunting filled my Supernatural withdrawals due to summer show break. The best part of my summer was a visit to Tarrytown, NY. Every fall I read Washington Irving’s Sleepy Hollow and every fall I am transported to the Hudson Valley where I’m introduced to his richly imagined characters of Ichabod Crane, Brom Bones, and the Headless Horseman. Washington Irving was America’s first internationally famous author, an ambassador to Spain, an art and theatre enthusiast, and socialite. His home, Sunnyside was most impressive. It reflected his romantic views of art, nature, and history. He planned out his yard with garden paths, trees, and water paths to look natural. 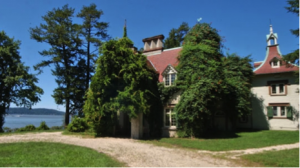 He built up the walls of the stream so that it would echo throughout the pathways and he built his house behind a hill so that as one approached from the walkway one would gradually see it covered in wisteria sitting on the Hudson. The house itself seems to have many different architectural influences from colonial New York, to buildings he’d seen in Scotland and Spain. To me it was the cottage you’d might happen upon in a fairytale. Walking the grounds was breathtaking and I couldn’t help, but wish, I could write there. Enjoy the rest of the summer. Happy reading!